With summer-like temperatures comes other summer weather patterns like a build up of clouds in the afternoon and the rain – either a stormy downpour or a steady light rain. 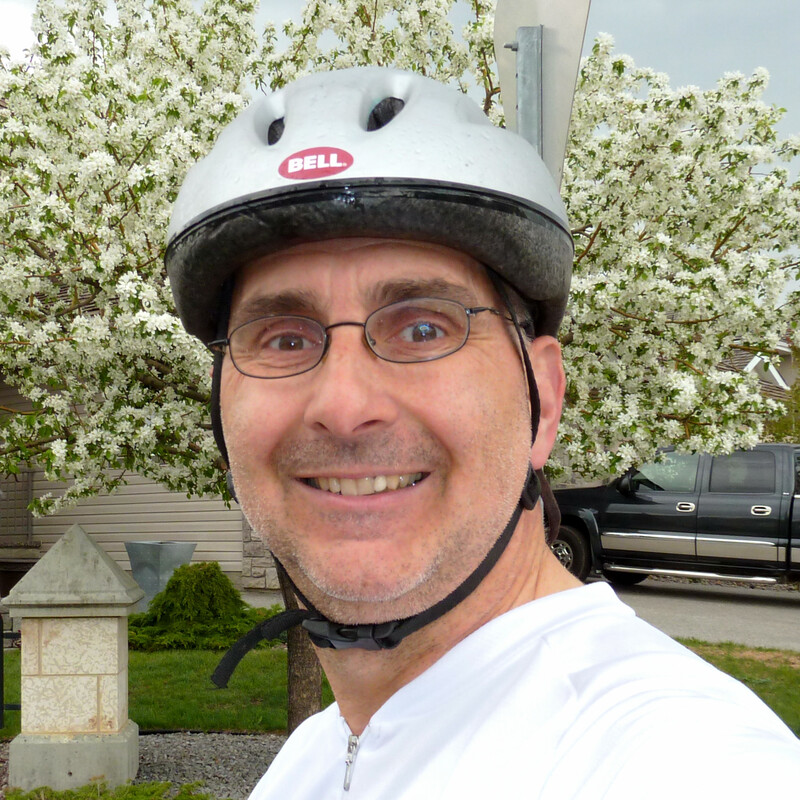 Yesterday afternoon (Sunday May 22), after doing some gardening in the morning sun I prepared to head out for a ride. By the time I got into my cycling gear, and got the tires pumped up, the sky in the west was getting quite dark. I knew there was a very significant chance of rain but the clouds didn’t look like the big thunderstorm type so I wasn’t going to chicken out and not do my ride. Faced with riding west towards the dark clouds or east towards the remaining blue sky I chose to go west. I figured if it did get rainy and windy and I had to dash home, better to do it with a tail wind than to have a driving rain in my face. I took one of my favorite routes from downtown Edmonton to the Terwilligar area. The sun was still shining for the most part as I headed west. One of the highlight of this ride was seeing the flowering trees in full bloom there were stunning deep pink trees in Louise McKinney Park (on the switchbacking trail through the rose gardens [map]) and on the trail through Rossdale. I should have stopped for a photo of these trees but thought I would do so on the way back. As I rode down River Road and south up Groat Road gradually the sky became overcast. It was still nice and warm with temperatures in the low 20’s so I felt very comfortable in shorts and a light short sleeve cycling jersey. I started to encounter a few rain drops as I made my way up behind Fort Edmonton Park. What a lovely stretch of trail that is, through a lovely grove of trees. It was fun to hear the old steam engine from the park chugging away just a short distance away through the trees. As I made my way up Whitemud Drive to the top of the riverbank [map], the rain became steadier and I became quite wet. I was glad I was on my touring bike, complete with fenders to save me from getting a wet and dirty stripe up my back, but by this time I was resigned to the fact that I was going to be wet. There is something about the rain that seems to accentuate the senses and make life seem richer. First there are less people out in the rain so you are more alone with your self and able to concentrate on your senses. I find that my senses seem so much more acute too. Even though there is no bright sunshine to give high contrast, the colors of anything wet seems more intense. The greens of the trees seem so saturated and the wetness on the roads turn them into highly reflective surfaces. I particularly noticed this cycling back along the wet Keillor Road path. The relatively new pavement was so shiny and black and to add to the atmosphere there was a wonderful mist coming off it, as the heat the asphalt had absorbed when the sun was shining was now vaporizing the water. The sense of smell also seems enhanced by the rain. The rain itself can have a very invigorating aroma but the humidity in the air also seems to carry the fragrance of the trees (which are already pretty strong and nice at this time of year). Of course it is important not to get carried away by the wonderful sights and smells. 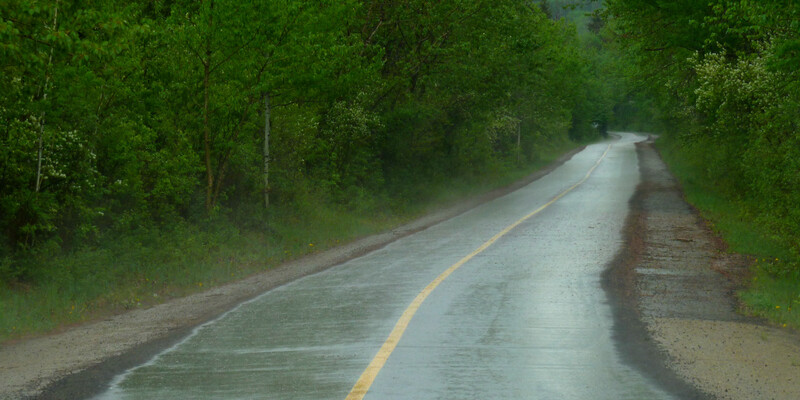 The rain does bring hazards to the road (particularly slippery spots) and so caution is required. It is important to have a heightened focus on the road conditions and to slow down appropriately. Somehow though that focus, that being in the here and now, also turns out to be a pleasure and benefit of riding in the rain. It can be a great experience – cycling in the rain. I don’t necessarily go seeking a wet ride but if rain happens just make the best of it!